Windstad Manor is a piece of property in Hjaalmarch, north of Ustengrav and east of the Abandoned Shack. It is one of three potential homes available with the Hearthfire add-on. After installing Hearthfire, you may purchase this plot of land at Highmoon Hall in Morthal. If Idgrod Ravencrone is still the jarl, speak with her steward, Aslfur; if the Stormcloaks have control of the hold, speak with the new jarl, Sorli the Builder or her husband Pactur. You will have to complete the quest Laid to Rest before being allowed to purchase land if Idgrod is still jarl; Sorli will allow you to purchase it out of gratitude for your help installing her, whether that was because of Season Unending or conquering Hjaalmarch for the Stormcloaks. When you ask if you can buy a house in the hold, you will be told that there are no houses for sale at that time, but a new plot of land is available. It will cost 5,000 gold. 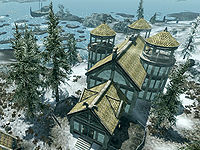 Your new property, Windstad Manor, will be marked as an undiscovered location on your map, located in the northern part of Hjaalmarch on a small hill, south of High Gate Ruins and just east of where the land lowers into the Sea of Ghosts. When you arrive on your new plot of land, you will find a drafting table, carpenter's bench, anvil, and chest south of the housebuilding area, just before the treeline. A "Log Pile" can be found slightly north of the drafting table. A clay deposit is directly adjacent to the north end of the log pile, while a stone quarry is a short distance further north, embedded in the cliff wall on the east side just before two snow-laden trees. Directly west from this point, towards the water, is a second clay deposit; another stone quarry is in the cliff wall just behind it. You can begin building your home immediately, with materials provided in the chest when you first arrive. A unique feature at Windstad Manor is you have the option to build a fish hatchery. Once built, the hatchery appears a distance north of your property, next to the second clay deposit previously mentioned. If you place any fish or fish eggs (Slaughterfish Eggs or Salmon Roe) in the column at the end of the jetty (only one of each species will be accepted) and return to your property in seven days, the netted area of water will contain several offspring of that fish. The Slaughterfish that spawn are tame and will not attack you. The house entrance will face to the south; looking west from there affords an impressive view of Solitude atop its natural arch. Like the other player-built homes, you will have the option to expand onto your home with a Main Hall, cellar, and three wing additions. See this page for pages detailing the furnishing options in each part of your home. Should you become a Thane of Hjaalmarch, Valdimar will become your housecarl. He will move to Windstad Manor upon construction of the small house layout. Roe can be harvested after killing the salmon with the Unrelenting Force shout. The offspring are not hostile to you, and slaughterfish egg nests will appear next to the jetty. The Nordic barnacle cluster and pearl oystersDB cannot be bred in the hatchery, though they are aquatic creatures. Dragonflies may appear above the water in the fishery as well. There is a group of three horkers near the hatchery. They may become tame once the hatchery has been constructed (see bugs). Frequent draugr (dead and undead), giant, and bandit spawns may occur here. One of the possible locations for a rupture to appear as part of Aftershock is located just beside the house. While living in Windstad Manor, adopted female children will sometimes say, "This place is scary. There are monsters in the swamp, I just know it." Certain spouses, such as Aela the Huntress, have a negative reaction to Windstad Manor, stating that wolves, bears, and spiders attack frequently. Go straight east from your entrance door, up the hill. The border is between the two trees growing next to the rocks on your left (there is a third tree on your right). North of the house. Past the quarried stone deposit and smelter, there are two trees. The border is just between the trees. Original surface items do respawn after 10 consecutive days of the house not being visited. The nest on the roof of the Main Hall yields a Rock Warbler Egg rather than the Hawk's Egg spawned at the other two Hearthfire houses. There are a few bugs which affect all houses. See the bugs section of the Houses page for details and fixes. 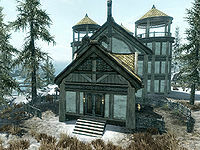 You will not receive the Windstad Manor Charter after purchasing the plot. Sometimes Sonir can get stuck in the fireplace if it is built. ? You may not be able to purchase the furnishings for the entryway after building it. Also, purchased furnishings for all other rooms may not appear. The option to purchase furnishings for the entryway may still be available after you have already bought them. If you try to select it a second time, your steward will refuse, acting as if you do not have enough gold to buy the furniture. The workbench in the cellar may not be removeable with the drafting table. To remove it, open the console, click on the table and type disable. You can place it again if you still have it selected in the console by typing enable, or by using the drafting table. The alchemy lab in the Alchemy Laboratory may not work properly. After purchasing the land and beginning construction, the house may not appear. After adding the main hall, the bag on the floor to the right of the door as you exit the original house is in fact two bags occupying almost the same space. Depending upon which you click, they can give the false impression that things stored there have been removed. If an item you stored seems to have disappeared, move the crosshair around until you find the other bag. Sometimes a giant or attacking bandit spawns somewhere inside the walls of the house in the outdoor cell of Windstad Manor. They can be heard and it can be observed through the Detect Life effect and the Aura Whisper dragon shout, but not interacted with. Leaving the cell (like entering the house) and returning usually moves the giant or the bandits outside the walls of the house. Sometimes the dead draugr from outside the nearby High Gate Ruins will spawn on the property.